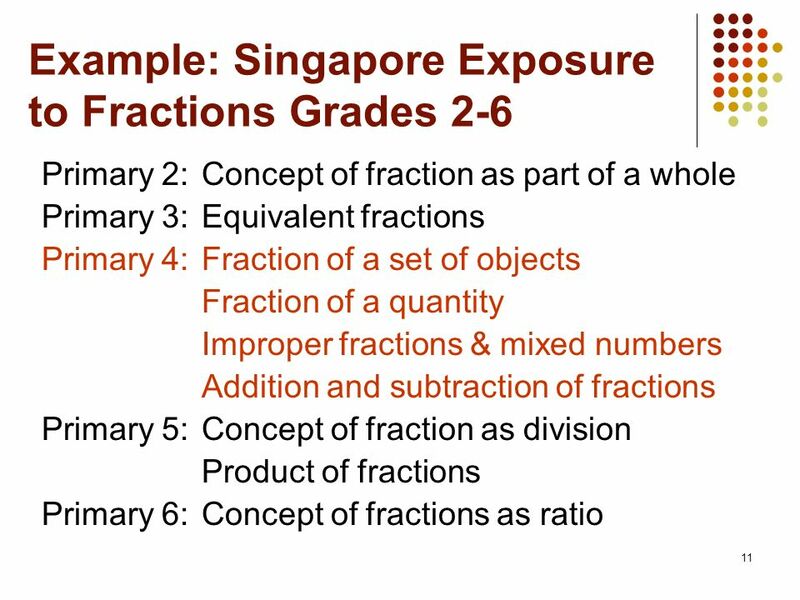 2 Presentation Outline Importance of primary mathematics. 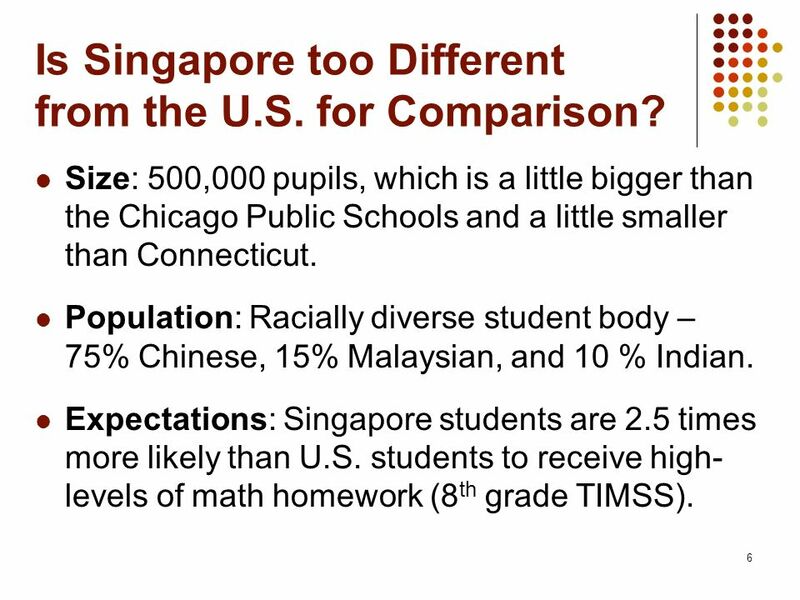 Can we compare U.S. and Singapore? 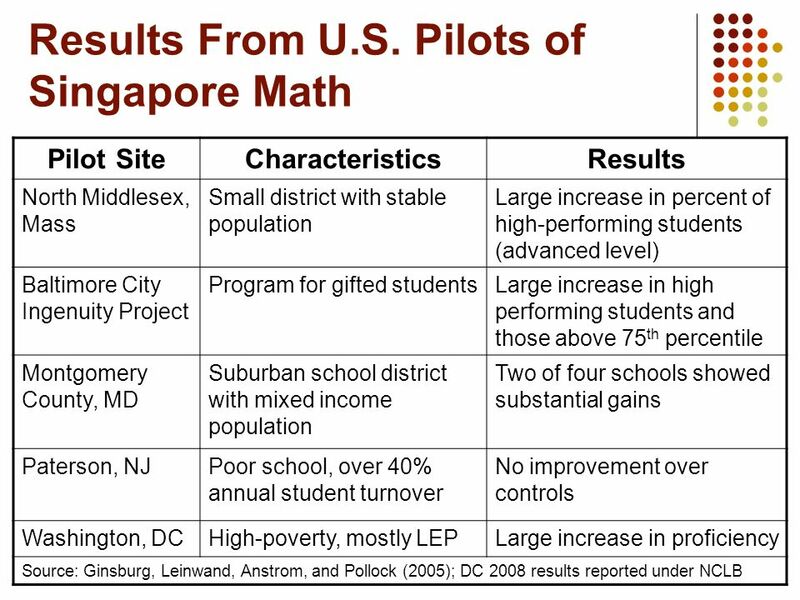 Results from U.S. pilots of Singapore Math. 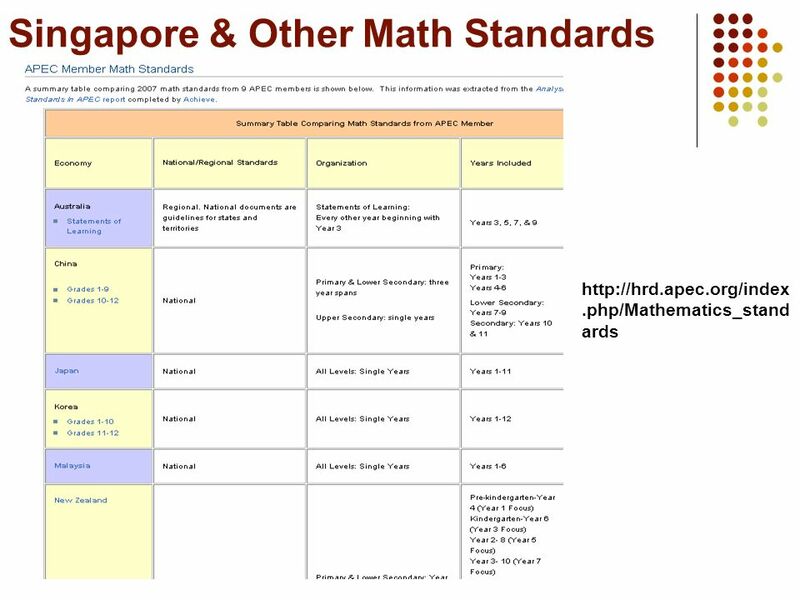 Comparing Singapore – U.S. math systems on: Frameworks Textbooks Assessments Teachers Singapore and other math standards online. 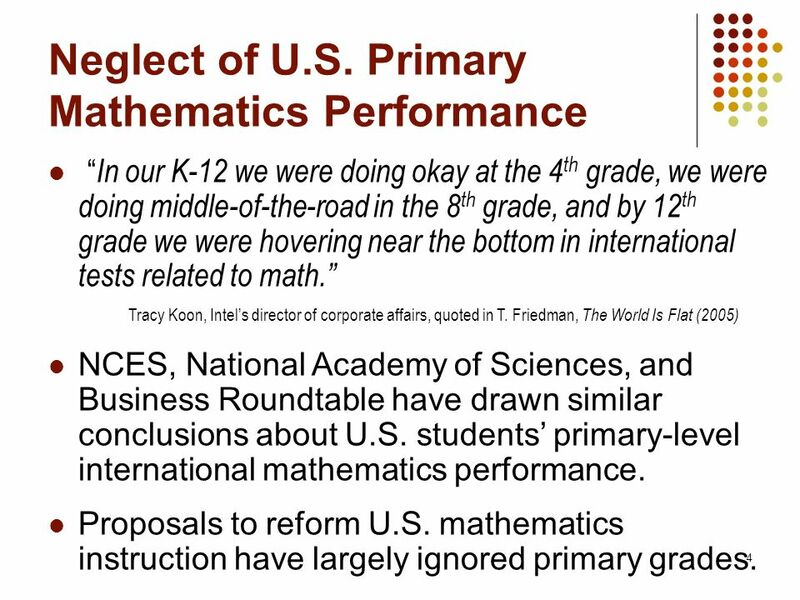 “In our K-12 we were doing okay at the 4th grade, we were doing middle-of-the-road in the 8th grade, and by 12th grade we were hovering near the bottom in international tests related to math.” Tracy Koon, Intel’s director of corporate affairs, quoted in T. Friedman, The World Is Flat (2005) NCES, National Academy of Sciences, and Business Roundtable have drawn similar conclusions about U.S. students’ primary-level international mathematics performance. 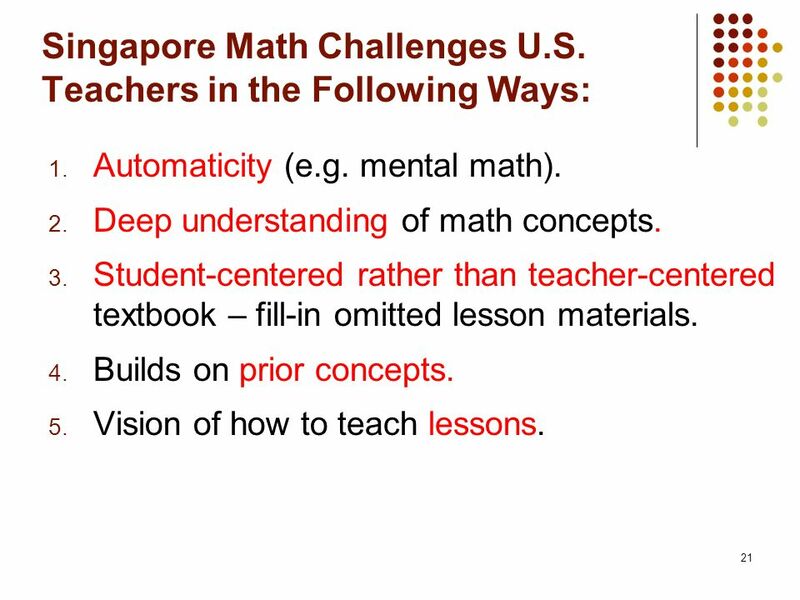 Proposals to reform U.S. mathematics instruction have largely ignored primary grades. 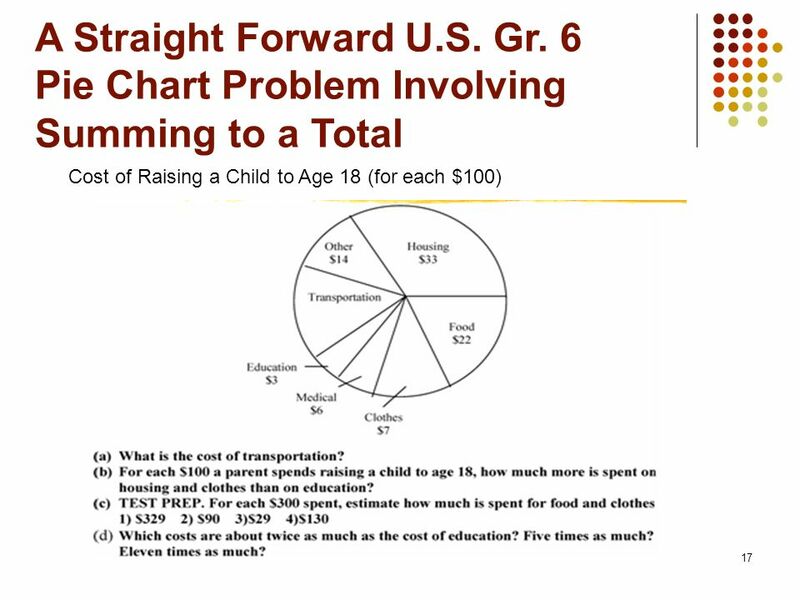 Source: TIMSS 2007 (Mullis, I., Martin, M., Gonzalez, E., and Chrostowski, S. (2008). 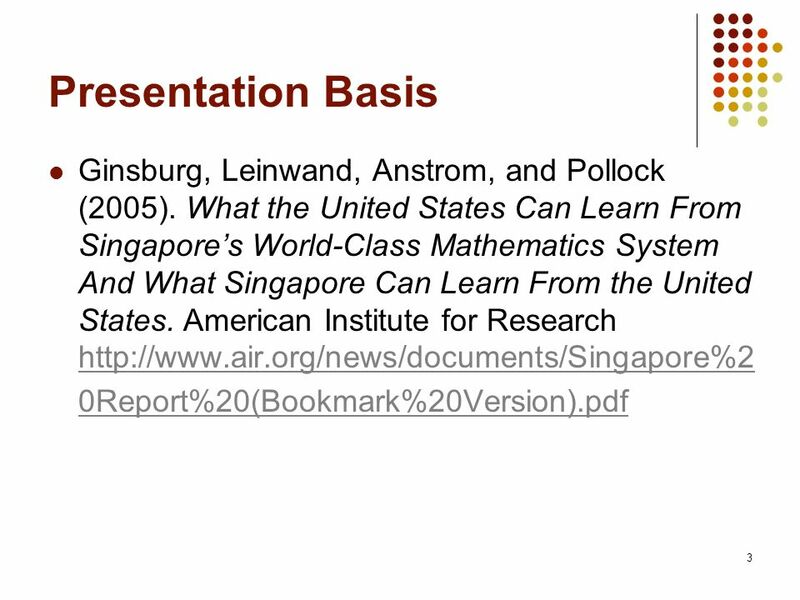 TIMSS 2007 international mathematics report. 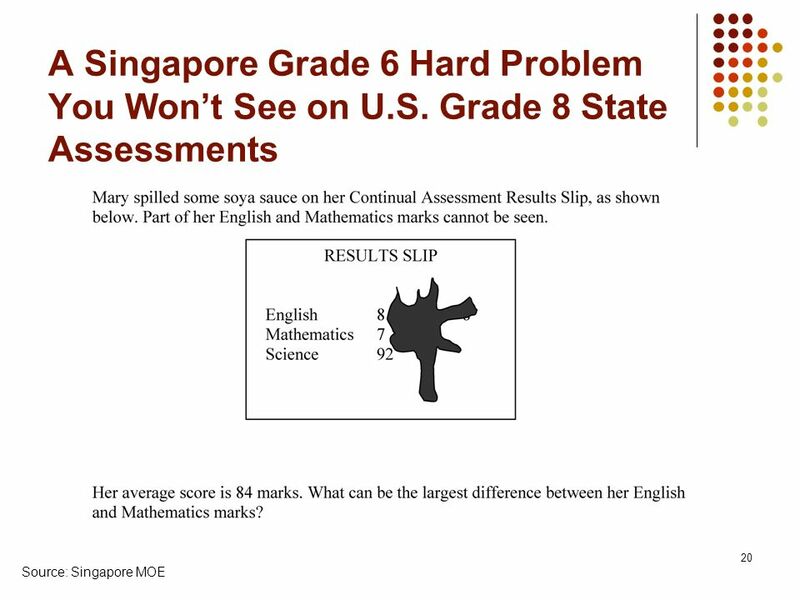 6 Is Singapore too Different from the U.S. for Comparison? 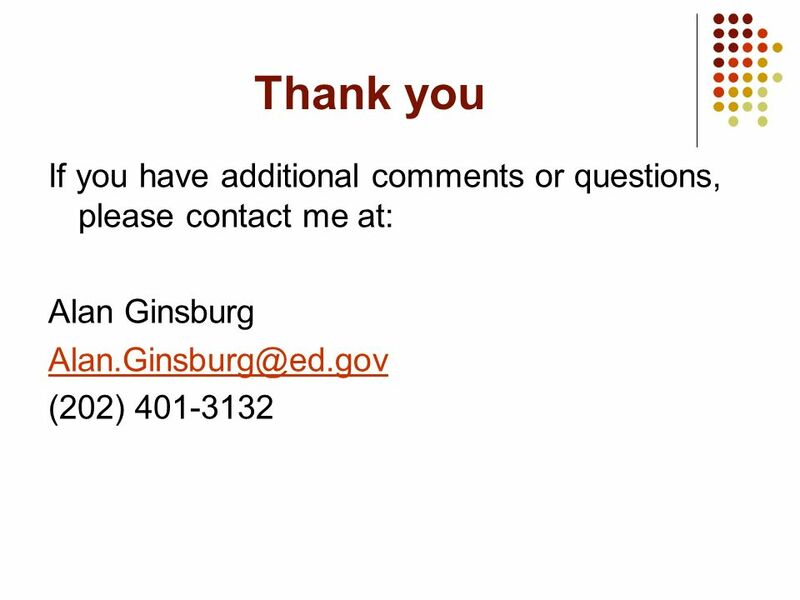 Size: 500,000 pupils, which is a little bigger than the Chicago Public Schools and a little smaller than Connecticut. 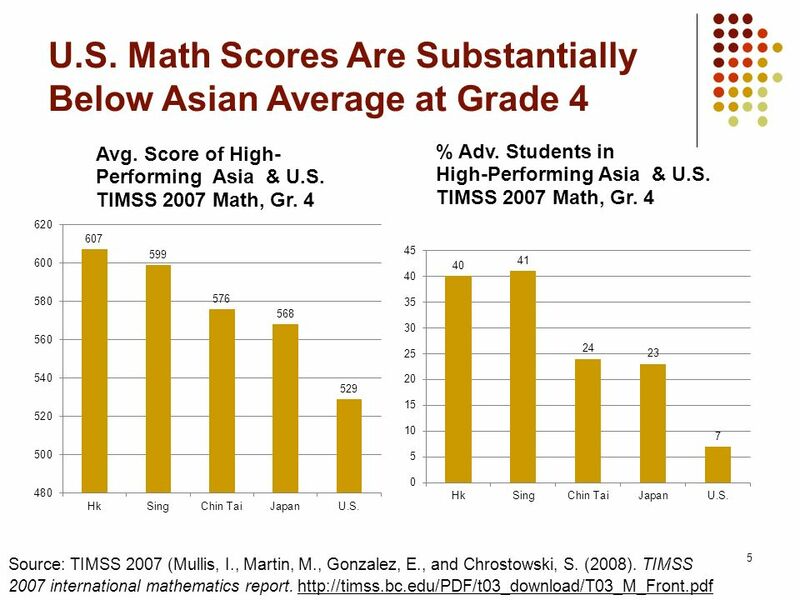 Population: Racially diverse student body – 75% Chinese, 15% Malaysian, and 10 % Indian. 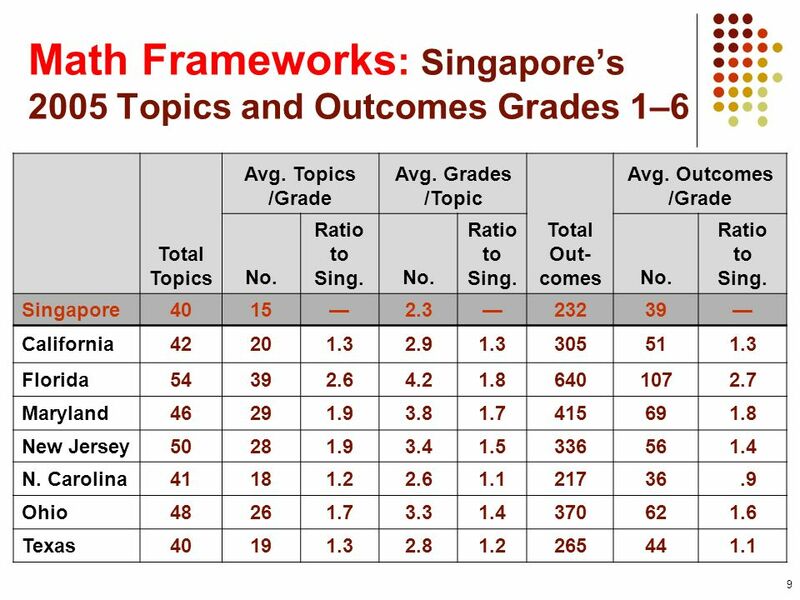 Expectations: Singapore students are 2.5 times more likely than U.S. students to receive high-levels of math homework (8th grade TIMSS). 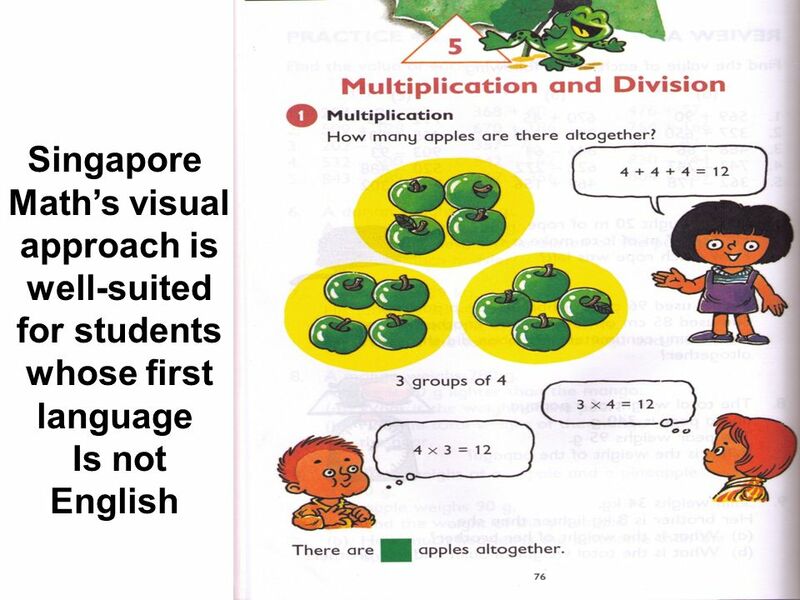 8 Why is Singapore Math Successful in Singapore? 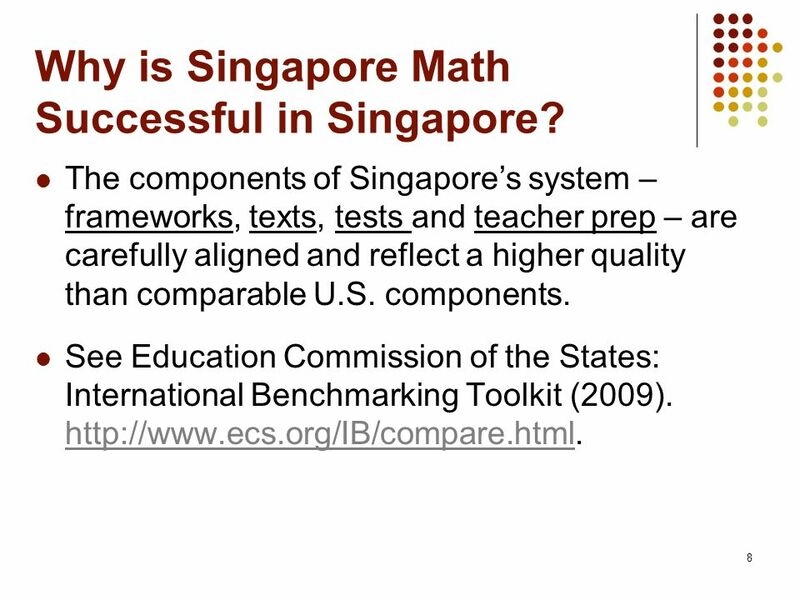 The components of Singapore’s system – frameworks, texts, tests and teacher prep – are carefully aligned and reflect a higher quality than comparable U.S. components. 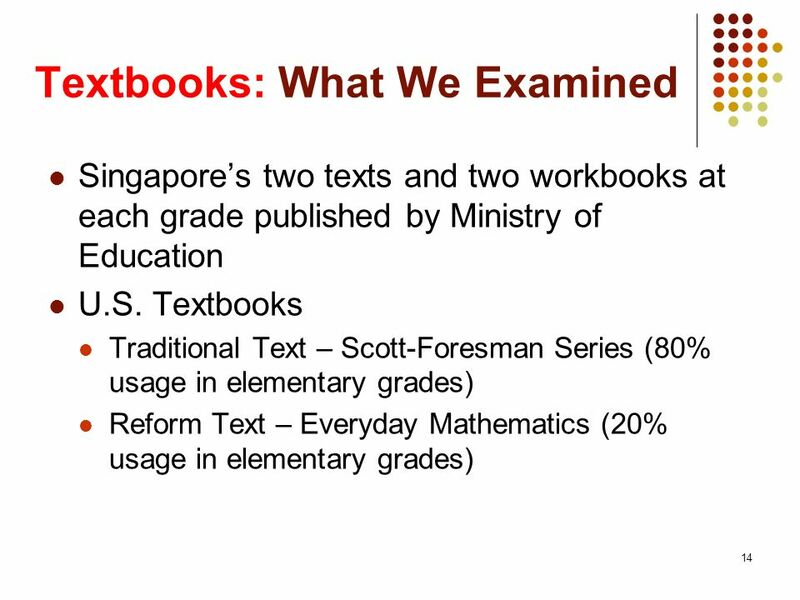 See Education Commission of the States: International Benchmarking Toolkit (2009). 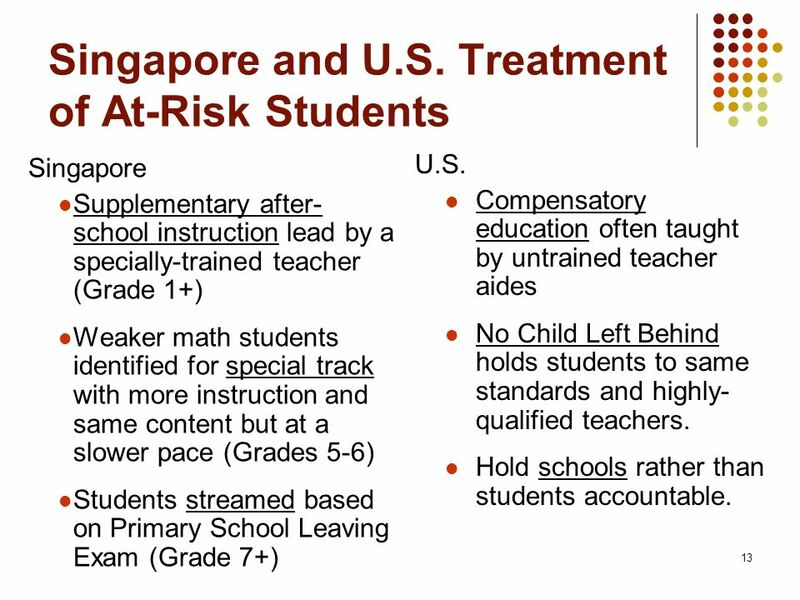 Supplementary after-school instruction lead by a specially-trained teacher (Grade 1+) Weaker math students identified for special track with more instruction and same content but at a slower pace (Grades 5-6) Students streamed based on Primary School Leaving Exam (Grade 7+) U.S. Compensatory education often taught by untrained teacher aides No Child Left Behind holds students to same standards and highly-qualified teachers. Hold schools rather than students accountable. 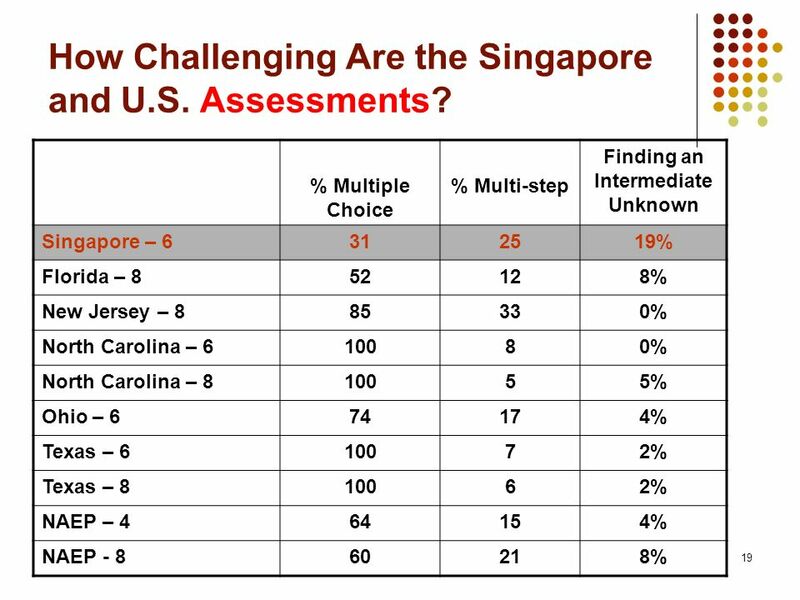 19 How Challenging Are the Singapore and U.S. Assessments? 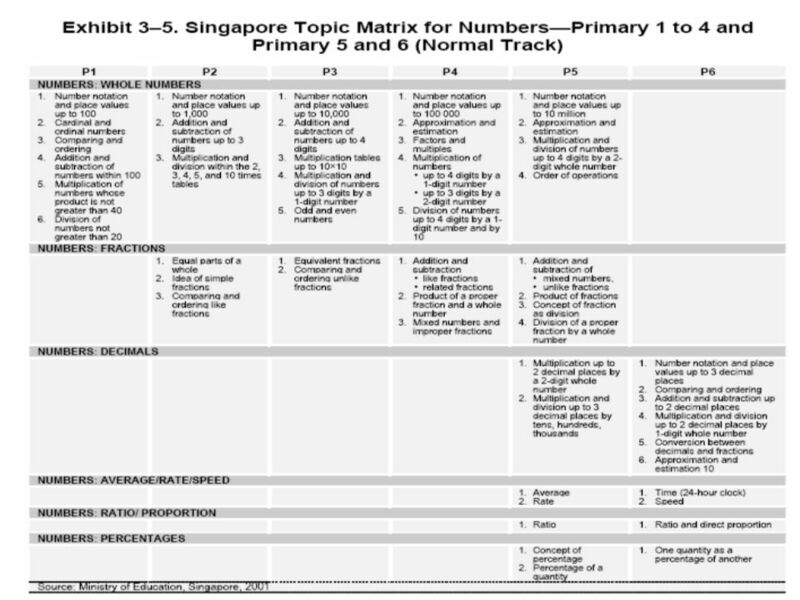 Automaticity (e.g. mental math). 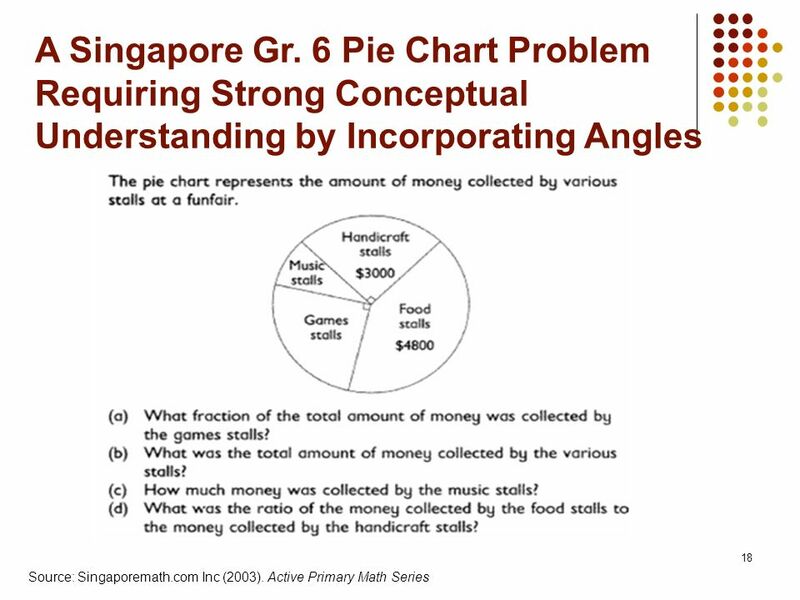 Deep understanding of math concepts. 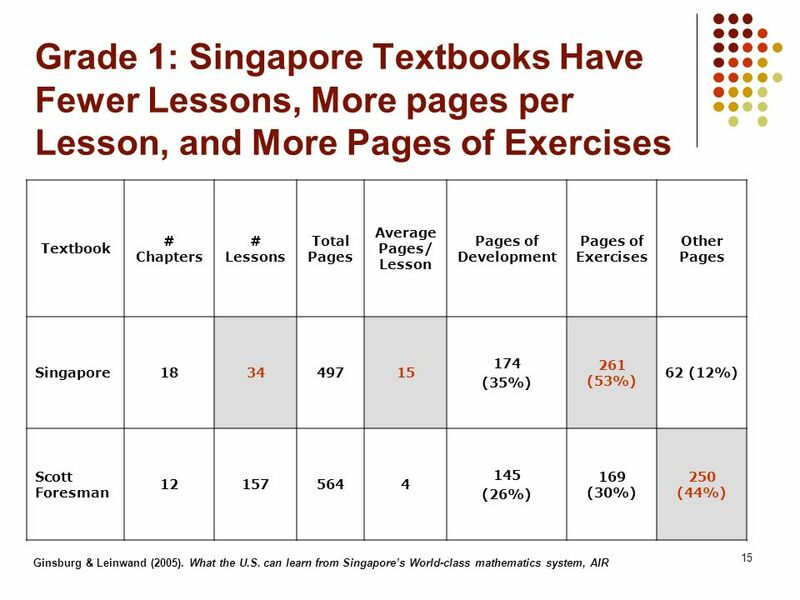 Student-centered rather than teacher-centered textbook – fill-in omitted lesson materials. Builds on prior concepts. Vision of how to teach lessons. 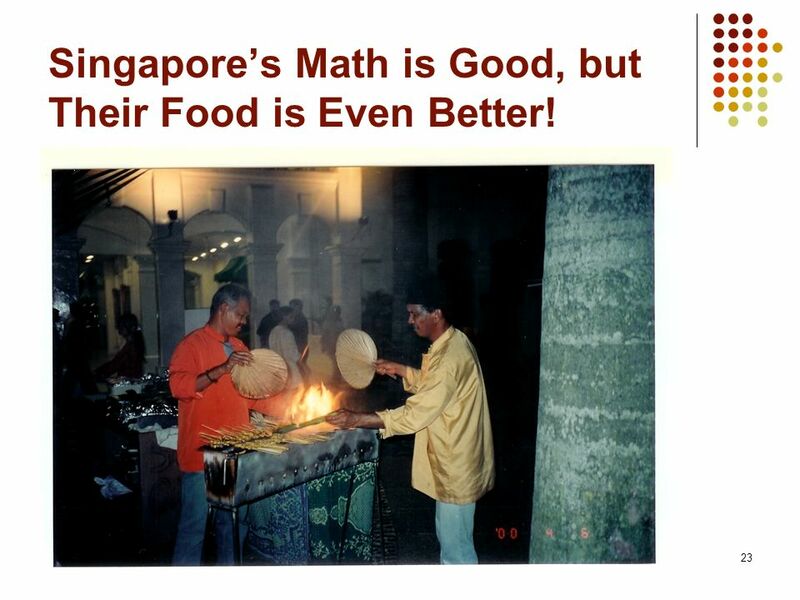 23 Singapore’s Math is Good, but Their Food is Even Better! 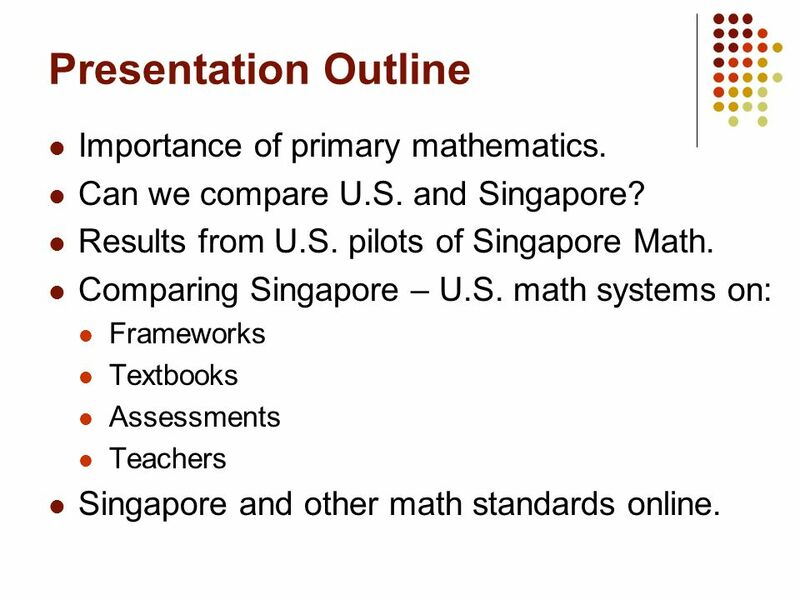 Download ppt "Singapore Math: How It Can Help Improve U.S. 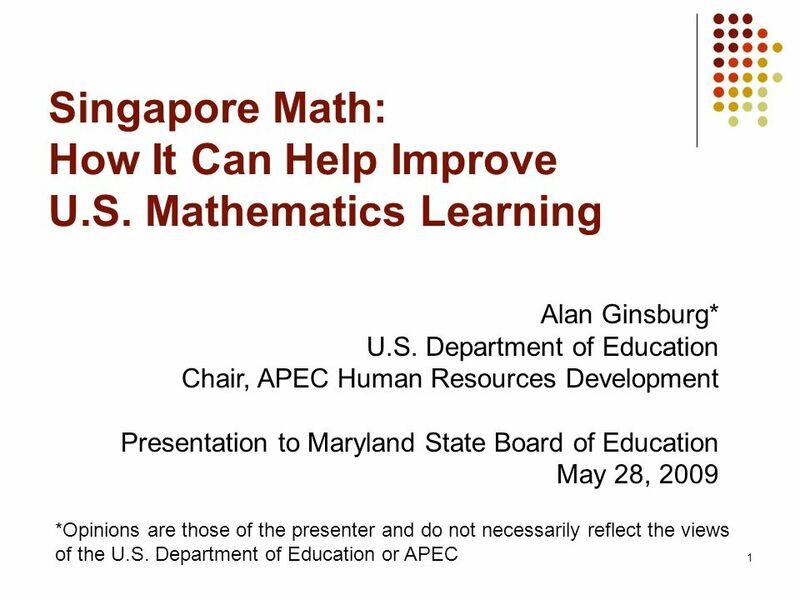 Mathematics Learning"
Stuart Kerachsky Acting Commissioner National Center for Education Statistics October 14, 2009 EMBARGOED until October 14, :00 a.m. E.D.T. 1 North Carolina National Assessment of Education (NAEP) 2009 LEA Training--Session A December 2008 Iris L. Garner, Ph.D. NAEP. 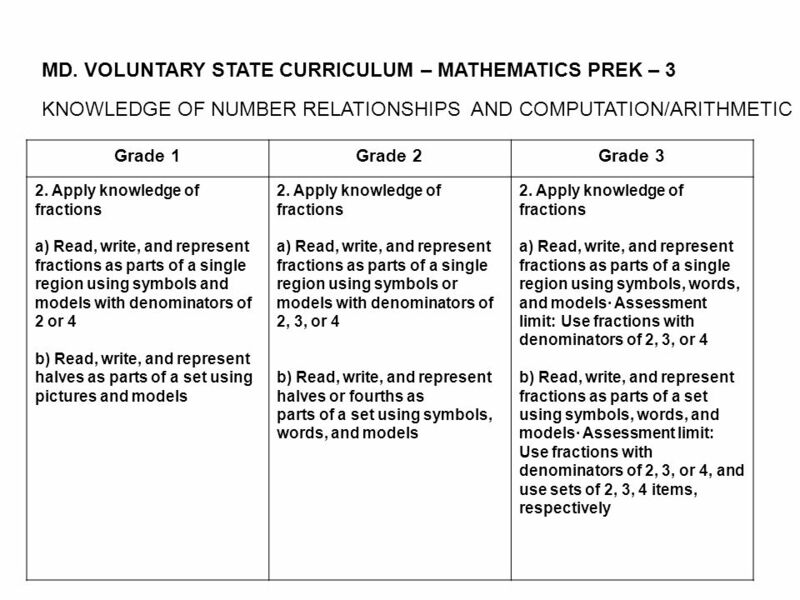 Common Core State Standards Math A Parents Guide. 2008 May 31Standards PD: Day 1 morning: slide 1 Welcome Welcome to the professional development sessions that focus on the K-8 Mathematics Standards for. Kindergarten Instructional Shifts-Focus. Why Common Core? Initiated by the National Governors Association (NGA) and Council of Chief State School Officers. Working Together: Understanding SBA Data Les Morse, Director Assessment & Accountability Alaska Department of Education & Early Development No Child Left. SBA to GLE: The Road Les Morse, Director Assessment & Accountability Alaska Department of Education & Early Development No Child Left Behind Winter Conference.